Arsenal are reportedly interested in making a move for highly rated Belgian winger Zakaria Bakkali, according to reports in the Metro. The 18 year old has been making headlines all over Europe with his performances for PSV this season. The winger made history in the Eredivisie earlier on this campaign by becoming the youngest player to ever bag a hat-trick and has found himself on the radar of a number of clubs. The Metro are carrying quotes from an apparent ‘source’ from inside PSV who is claiming that Arsene Wenger rates Bakkali highly and is aware of the growing interest in the player. Bakkali is a player that Wenger rates highly. Arsenal have kept an eye on him and are aware that other teams want him, so could move in the summer to buy him. Real Madrid and Benfica are also said to be interested, having sent a number of their own scouts to watch him this season and may provide competition for the Gunners. 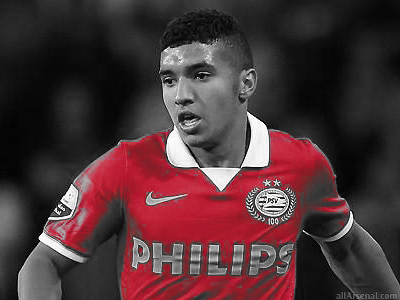 Bakkali has made 20 appearances in all competitions for PSV, tallying 4 goals, while producing an impressive pass success rate. He is reportedly worth £2 million at the moment, but it is expected to increase heading into the next transfer window. He has drawn comparisons to Barcelona attacker Alexis Sanchez and compatriot Eden Hazard in the past due to similarities in playing style. He is primarily a winger but can double up as a striker as and when required and is equally comfortable with both the feet, he has a really sweet right foot. He was usually deployed on the left wing for the PSV youths, which allowed him to cut inside and shoot with his aforementioned right boot. He stands at 5 ft 5 in and covers the ground very quickly thanks to his short stature and blistering pace. He is gifted with great body balance and excellent acceleration, which allows him to take on any fullbacks easily and his dribbling abilities are already top notch. He’s certainly a Wenger type of player and looks to have a bright future ahead of him, but with Real Madrid and Benfica also interested we could face a real fight for his signature. However with Wenger’s track record of developing young talent they could be considered favourites.